ROB CROSS ended Michael van Gerwen’s reign as William Hill World Darts Champion in an epic 11-set semi-final on Saturday as he set up a decider with Phil Taylor, whose dream finale continued with a 6-1 defeat of Jamie Lewis at Alexandra Palace. Cross has enjoyed the most spectacular debut year in the sport’s history since turning professional at the start of 2017, winning four events and reaching the European Championship final during his rise into the top 32. The 20th seed will now contest the richest-ever darts match in Monday’s final as he takes on legendary 16-time World Champion Taylor – who will be competing in his final game before retirement. Cross ended Van Gerwen’s bid to retain the World Championship title in a two-hour slugfest which left a capacity Ally Pally crowd captivated. The 27-year-old former electrician matched Van Gerwen every step of the way as they traded heavy blows time after time and in the end they could only be separated by one single game of sudden-death 501 after remaining locked at five-all in the final set. Both men won 27 legs and they combined for a semi-final record 31 maximums, but the key stat is the six match darts which Van Gerwen missed as he saw his title slip away in the dramatic finale. Van Gerwen missed five of those chances in the tenth leg of the final set, allowing Cross to force the sudden-death leg where he punished a further miss from the Dutchman before landing double eight to seal a momentous victory. “Words can’t explain it, they really can’t,” said Cross. “Obviously I’ve lost to Michael a fair few times but tonight was my turn. Cross has not been able to get the better of Van Gerwen in a televised game previously, including losing in October’s European Championship final, but showed his class in adapting to the big stage in Saturday’s triumph. “I’m confident in my own ability and I actually think if I come out and play like I can, near my best, then I actually believe I can keep up with Michael every day,” said Cross. 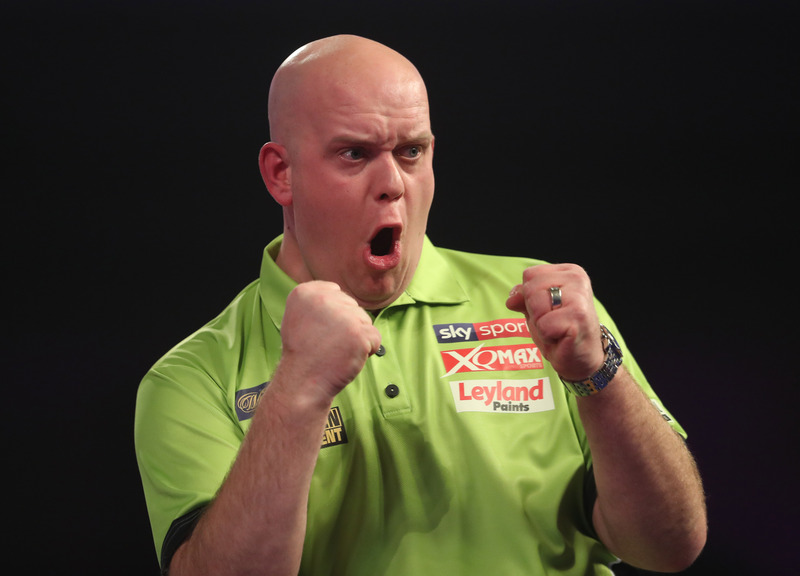 “I hate losing, especially in this tournament,” admitted Van Gerwen afterwards. “I think I was better than Rob but on the important moments I could not bring something extra. “Missing these doubles was extremely painful. There was nothing I could do about it. He played really well, all credit to him. But I should have won this. I can only blame myself and nobody else. “Of course he’s a great winner. But I think I deserved to win this match to be quite honest. I had six match darts and normally I don’t miss that many. I’m sick of it. “I think this is just his year. He had the luck going for him. It’s that simple. Those doubles were so close on the wire. I’m sick about that. Normally that doesn’t happen to me and I’m the only one to blame for it. 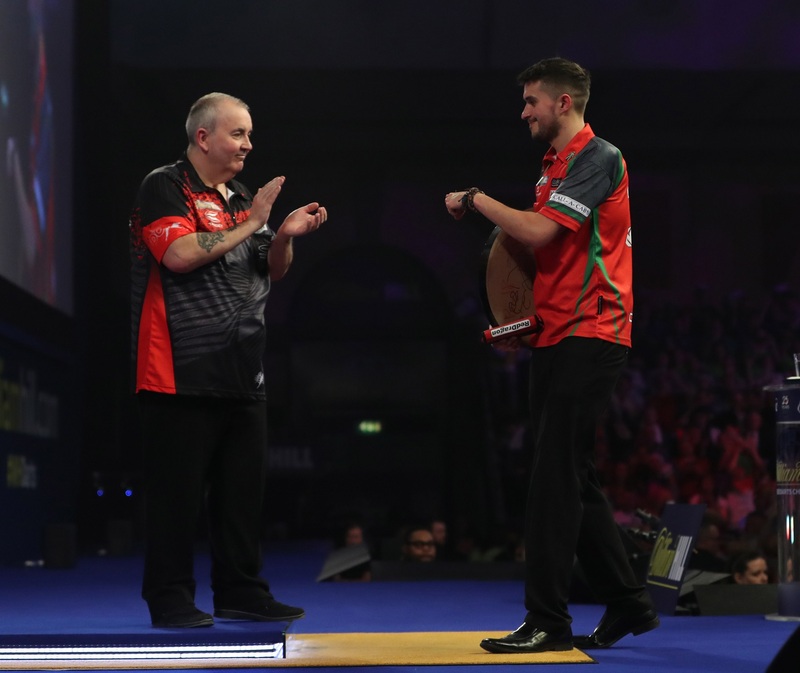 That unforgettable clash had come after Phil Taylor’s amazing last tournament continued as the 57-year-old’s bid to win a 17th World Championship saw him power past Jamie Lewis 6-1 in their last four tie. Taylor maintained his proud record of having never lost a World Championship semi-final as he made it into the final for the 21st and final time, although his win was harder than the scoreline suggested. 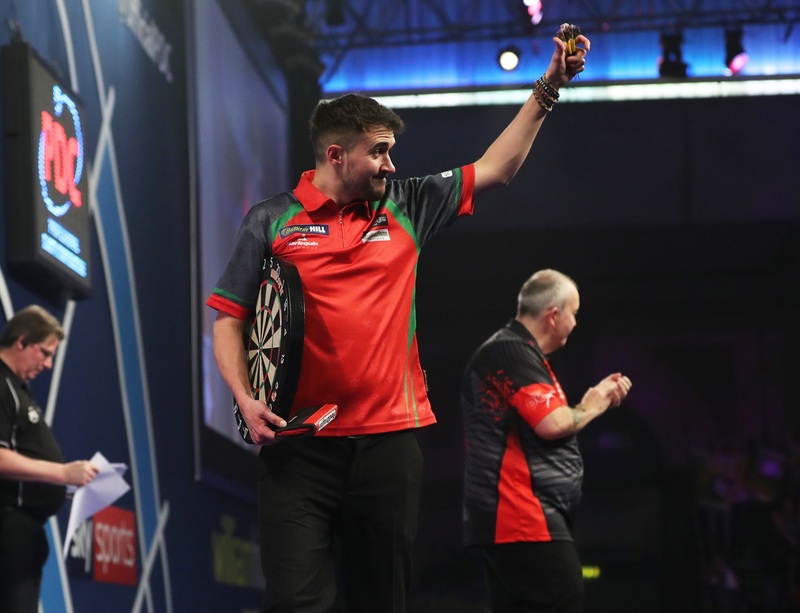 Lewis claimed the game’s opening set but agonisingly lost the next three in a deciding leg as Taylor moved ahead, and the young Welshman eventually paid the price for nine missed set darts. “It’s surreal to be honest with you, it’s like I’m not even here,” said Taylor. “It’s like winning the lottery. “It was a struggle. Jamie’s one of the players who’s very steady, very accurate, he doesn’t show any emotion, doesn’t show any fear, he’s fantastic. “I played on Jamie’s lack of experience, that’s all it was. He missed a couple of crucial doubles there. He had me, in first two or three sets there I didn’t know where I was and I was struggling. A naturally disappointed Lewis, who became the first player to win through to the semi-finals after starting in the preliminary round, admitted that the enormity of the game, in his first televised semi-final, hampered him. “I was trying to blank it out but the occasion got the better of me,” Lewis conceded. “Deep down I was thinking that I could be the last man to beat Phil Taylor in a World Championship. “I had chances early on and misses a few crucial doubles, and Phil punished me. The pressure got to me a little bit but I will learn from it. “My doubles have been good all week but I missed some today at important times as well, which you can’t do against Phil. Taylor admitted that he never thought he’d be able to reach the final on his farewell visit to Alexandra Palace but the clinical nature of his darts has returned him to the showpiece once again. “The first round against Chris Dobey I knew I was in for a battle, but I thought if I got passed him then I could have a run at it,” said Taylor, who retires following Monday’s final. Taylor is now the 4/5 odds-on favourite with sponsors William Hill to win Monday’s final, with Cross rated at Evens to capture the Sid Waddell Trophy and the £400,000 first prize. PHIL TAYLOR’S career will come to an end in the William Hill World Darts Championship final after he defeated youngster Jamie Lewis 6-1 in their semi-final at Alexandra Palace on Saturday. The 57-year-old maintained his proud record of having never lost a World Championship semi-final as he made it into the final for the 21st and last time in his glittering career. Welsh qualifier Lewis was cast in the role of retirement party pooper and he played a lot better than the scoreline suggests, but paid the price for missing key doubles as Taylor came from a set down to claim victory. Lewis averaged just two points less than Taylor and hit 11 maximums, but scoring was never going to be the issue as nine missed set darts ultimately cost the qualifier. Coming from 2-0 down to win the first set showed that Lewis had the character to challenge Taylor and it looked like being a long, tough challenge for the 57-year-old darting legend. The first four sets all went the full distance and Lewis had chances to win each, but instead found himself 3-1 down as Taylor’s clinical finishing proved the difference, as it has done so many times over almost three decades. A dip from Lewis saw Taylor go 5-1 up, but he still fought admirably in the sixth as four legs went against the throw before a 180 in the last helped the 16-time World Champion edge the decider. Lewis’ battle continued in set seven as he claimed the first two legs, but a 95 finish from Taylor reduced the deficit. Two more set darts went begging for Lewis as Taylor levelled, and one last desperate attempt came agonisingly close for the 26-year-old as he missed his nemesis double 16 for what would have been a spectacular 152 checkout. ROB CROSS booked his place in the William Hill World Darts Championship final on his tournament debut after a breath-taking sudden death victory over defending champion Michael van Gerwen. 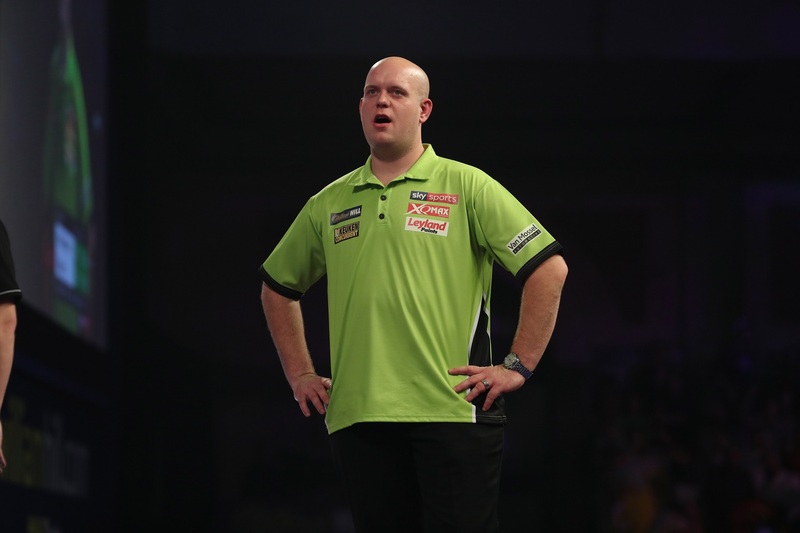 World number one Van Gerwen averaged slightly higher at 102 and hit 16 maximums, but was strangely shaky on his doubles – including missing six match darts in a nail-biting finale. Both men won 27 legs in total as the momentum swung one way and another, with the pair trading 180s, 140s and big checkouts in another classic encounter at Alexandra Palace. Cross came into the tournament with a lofty reputation despite only starting life as a professional this year, and matched Van Gerwen every step of the way before holding his nerve under the heaviest of pressure in a deciding set. Having been labelled by some players as the next Phil Taylor – including by the man himself – it is ironic that he now faces the 16-time champion in what will be the final match of the Stoke legend’s career on Monday. Van Gerwen started a leg with two 180s three times, while Cross took out some amazing checkouts – including a roof-raising 161 to win the fifth set with the Dutchman waiting on 81 following a maximum. Cross was always nudging a set ahead until Van Gerwen took the eighth and ninth sets to lead 5-4, but the debutant showed huge spirit to break and land an 11-darter as he hit right back and force a final set. Van Gerwen broke in the opening leg of the set, but Cross levelled before then going ahead and forcing the world number one to hold throw to stay in the match. Cross had the first dart for the match when he narrowly missed the bull at 4-3, but he then missed two double 16s as Van Gerwen broke to go 5-4 ahead. Nerves were being well and truly tested but it was the two-time winner who faltered as he missed five darts for the match, allowing Cross to hit double 18 to force a sudden-death leg. Cross won the bull to throw first and he got the first match dart of the leg when he missed double 16, but Van Gerwen also missed the same with his last dart in a bid to finish 108, as a sixth chance to seal victory went begging. Cross stepped up and took out double eight with his first dart to secure his place in the final, becoming the first debutant to reach the World Championship decider since Kirk Shepherd a decade ago.